Deceptively spacious semi detached property with accommodation over two floors. 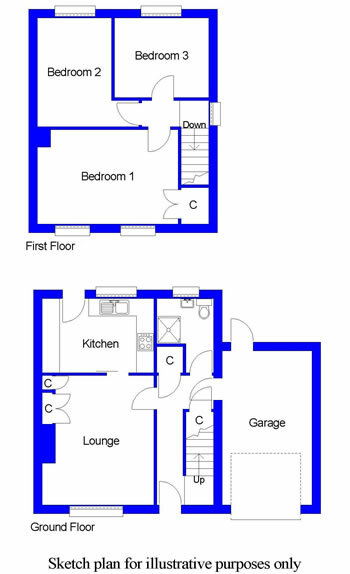 The property has three bedrooms and benefits from gas central heating and double glazing throughout. Easily managed garden with driveway offering off road parking and access to the garage. Double glazed entrance door and stairs leading to the first floor with understairs cupboard. Shelved cupboard and door giving access to the garage. Radiator. Fitted with range of floor and wall units with ample worktops and inset single drainer sink. Space for slot in cooker and plumbing for washing machine. Double glazed door leading to garden. Radiator. Disabled shower cubicle with electric shower and wet wall panelling. WC and wash hand basin. Radiator. Two west facing windows. Cupboard housing boiler. Radiator. Power and light laid on. Back door leading to garden. The front garden is terraced and a short drive gives access to the garage. The rear garden is mainly in grass for ease of maintenance. Mains supply of gas, water and electricity. The property is connected to the mains drainage system. EPC = C.
The property is band B. By arrangements with the Selling Agents. 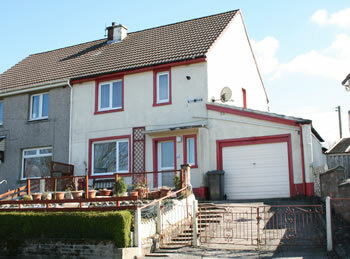 Offers in the region of £85,000.